Those interested in buying an exclusive engagement ring, may want to first check out the book, 7 Ways to Buy an Engagement Ring She’ll Love. This is the best way to start researching how you’re going to impress her with an engagement ring she’ll love. First you’ll want to discuss the basic considerations you’ll have when purchasing a ring, such as the variety of ring styles, stone shapes and budget range. A diamond shape and cut are not the same thing. A cut refers to the number of facets and how these facets are proportioned. The shape is the way in which a stone is cut. For example, Round Brilliant Cut, Emerald Cut, Pear cut. You get the point. Buyers should secondly take into consideration that they will be paying more for a higher clarity and color than simply the carat size alone. A 2 ct round diamond that is Internally Flawless and a D color, is significantly more valuable than a 5 carat Vs2, J Color. The higher in color and clarity the diamond is, the more valuable and expensive it will be. You’ll want to go window-shopping for a ring. You can do this alone or with her, though it might be good to nonchalantly ask her questions while window-shopping one day in order to get a sense of what she’s looking for! If you choose to just simply pick out a particular stone, then you might want to consider having a jeweler place it on a very basic setting, propose and then pick out the actual setting together. That way she can get the ring she wants and you can get the benefit of surprising her! 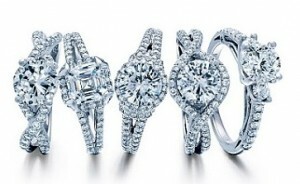 Engagement ring shoppers may also strive to find cost-effective ways to purchase a diamond ring. Keep in mind that you need not stick to that old saying that an engagement ring should be two month’s salary. If you can’t afford that, consider going for a smaller diamond and accenting it with a wedding band. You might also make use of a family heirloom and transform that into your engagement ring–something she is sure to appreciate because of it’s sentimental value. Antwerp’s diamond district is a treasure trove of diamond factoids, diamond history and, of course, diamonds. It is the city which handles nearly 80 percent of the world’s rough diamonds and over 50 percent of the world’s precious stone-quality diamonds. The diamond district in Antwerp is a small area (only a square kilometer) and also holds the Diamond Museum, a world-renowned museum which provides an in-depth look into the diamond industry and its worldwide impact. Here are some interesting factoids about the ever-changing world of diamonds that you probably didn’t know. Pink diamonds originate from Australia. Research shows that nearly all natural pink diamonds are found in Australia’s Argyle Mine. Until 1990, De Beers owned 90 percent of the diamond market. And what’s even more ridiculous is that almost all diamond purchases before 1990 put some money into De Beer’s deep pockets. Many dentist drills are embedded with diamonds. That’s because diamond is virtually unbreakable! Almost 80 percent of diamonds mined are ground into diamond powder. What’s all that diamond dust for? Most of it is melted into the metals of drills, knives, saws and other metal tools. The word “diamond” has its etymological roots in the word “indestructible”. Not a bad word linkage for what is known to be the hardest substance on the planet. “Diamond” is a mutation of the Greek word “adamas”, meaning “indestructible”. Diamonds cut before 1950 have a different shape from most diamonds cut after 1950. Gemologists established the “Antwerp” cut in 1950, in which they found a shallower geometry to cut, which distributed more light and sparkle. The term “carats” is actually a reference to the diamonds equivalent weight in carob seeds. “Carat” is a derivative of the Greek word for “carob seed”. Fluorescence is the emission of visible light by a material when ultraviolet light, x-rays, or other forms of radiation stimulate it. The term “fluorescence” is derived from the mineral fluorite; which is known for displaying intense fluorescent colors. When diamonds with fluorescence are viewed under UV light, they will most often display a blue color. Diamonds can fluoresce purple, green, orange, yellow, red, or white. The fluorescence is often seen in patches and diamonds can still fluoresce after the UV light is turned off which is called phosphorescence. Diamonds with blue fluorescence will have a yellow-green phosphorescence. Under x-rays a diamond will usually have a blue-white glow. Certified diamond reports will list whether or not a diamond has fluorescence under a UV light and the strength of the fluorescence. Fluorescence is not a grade like cut, clarity, or color it is just a description given to further identify the diamond. The GIA categories for fluorescence strength are none, faint, medium, strong, and very strong. The AGS categories are negligible, medium, strong, and very strong. Irregularities in the diamond’s atomic structure cause fluorescence. Although the chemical structure for a diamonds contains only carbon, traces of other elements such as nitrogen, boron, or aluminum can be found. Nitrogen and aluminum create blue fluorescence, a single nitrogen atom will create yellow fluorescence, and two nitrogen atoms with crystal irregularities from radiation will create green-yellow fluorescence. What is the difference between UV light and Fluorescent light? UV lighting fixtures emit UV light and fluorescent lighting fixtures emit visible light. Even though both lights are similar, fluorescent lights are coated on the inside and absorb the UV light emitting only visible light. Are diamonds with fluorescence less valuable or less desirable? Many believe the answer to this question is still up for debate and we say it depends on the diamond’s color and strength of the fluorescence. Diamonds in the near colorless range with strong fluorescence usually sell at a discount and can make the diamond look oily, hazy, or milky. On the other hand, fluorescence can work in your favor. Diamonds with strong blue fluorescence in the I and lower color range will make the diamond look whiter in natural light. Diamonds are beautiful and should be judged by normal light. A diamond should be selected under the light source it will be worn in. Do you know anyone that carries around a UV lamp? When shopping for a diamond for engagement rings, don’t let the word “fluorescence” deter you from looking at the diamond further. Like color and clarity if the fluorescence is strong you will notice it regardless of lighting. To make them look new and more modern – an Old Mine cut can be re-cut into a modern round brilliant (image shown below). This will add brilliance, fire, and scintillation. What once was an antique style cushion cut will now be modern and beautiful. To make them look antique – opposite of above….take a round brilliant cut and have it cut to an antique style shape. To improve brilliance – adding additional facets will increase brilliance to any diamond. To improve the cut grade – changing the diamond’s proportions will increase the cut grade. To improve the color grade – excess diamond weight can be removed to increase the color grade. To improve the clarity grade – certain clarity characteristics can be removed or polished away increasing the clarity grade. It is not impossible to improve a clarity grade from a SI1 to a VS or VVS grade or even flawless. After looking at this list, you may be wondering why diamond cutters don’t just cut diamonds originally to produce the best color, clarity, and cut possible. The reason – diamond cutters try to retain as much weight as possible from the diamond rough to maximize its value. Diamond cutting is a skill and cutters need to compromise between beauty and value. In the end, the value and salability of a finished diamond determines how a diamond is initially cut and whether or not a diamond is worth re-cutting. When thinking of re-cutting your diamond it is important to discuss your options with a jeweler. What you see as a dull chipped diamond may be a prized possession to others. Over the years, diamond cutting and technology has changed. If you take a look at your grandmother’s diamond you will notice the difference in brilliance, fire, and symmetry. The round diamonds of today are much more brilliant than those of yesterday. Why do people re-cut their original stones? Sentimental value – Many of us get engaged at an early age and purchase the best diamond possible at that time. Over the years, our budget and taste may change, but some are attached to the sentimental value of their original stone and upgrading is not an option. Re-cutting is a great option for those holding onto their original stone for sentimental reasons. Wear and tear over the years – even the hardest material on earth gets worn with age…over time diamond girdles may chip and your table and upper facets may get scratched. Having your diamond polished will make it look as good as new. To increase the color and clarity grade – with cut grade being the most important factor when purchasing a diamond often times color and clarity are sacrificed. Having your diamond re-cut will enhance both. Never think your diamond is beyond repair. It’s amazing to see a poorly polished dull looking or damaged diamond re-cut into a beautiful brilliant stone. In most cases, you will loose some weight off your diamond, so before starting the process be sure to think about all your options carefully. When discussing options with your jeweler, ask to see an example of what your diamond may look like after it is re-cut. Place your diamond and the jeweler’s diamond side by side. This will give you a good idea of what you can expect and will help you decide. The cost of re-cutting varies from stone to stone. A diamond that just needs a little polishing will cost much less to repair than a diamond being re-cut for color or clarity. Shop all Since 1910 engagement rings to find the perfect setting for your newly re-cut diamond. The term “color” in white diamonds actually refers to the lack of color present in a diamond. Diamonds composed of pure carbon are colorless and extremely rare and costly. Most diamonds contain nitrogen, boron, or hydrogen all of which impact color. A majority of white diamonds sold on the market today contain traces of nitrogen, which causes slight shades of yellow or brown. Small, subtle differences in color can make a substantial difference in a diamond’s value. In a effort to eliminate confusion related to diamond color, the Gemological Institute of America (GIA) implemented the color grading system in the 1950s which is still being used industry wide today. Diamonds are graded on a scale beginning with the letter D (colorless) and ending with Z (light yellow or brown). When creating the new color scale GIA chose to start with the letter D as a means of starting over. Prior to GIA implementing the D-Z scale, other systems all of which were inconsistent and inaccurate, already used the letters A-C, numbers 0-3, and the Roman numerals I-III. Diamond color is largely a personal preference. Some people prefer a colorless diamond while others prefer the warmth of a diamond having a trace of color. If you do not have a specific color choice in mind, you should always choose the highest color grade within your budget. As mentioned above, diamonds are graded on a scale from D-Z. Z colored diamonds should not be confused with fancy colored diamonds. While slight color variations in the colorless and near colorless ranges may not be that noticeable, diamonds graded beyond H may be noticeable to some with the unaided eye. E – almost completely colorless. E colored diamonds have microscopic traces of color which can only be seen by a trained expert. G – nearly colorless and an excellent value for you money. Color will not be seen with an unaided eye. These diamonds have color that is visible to the unaided eye. These offer a great value for someone that is not looking for a colorless diamond. Many factors should be considered when deciding on color. You should always look for a diamond that is as white as possible within your budget. When a diamond is well cut the diamond’s refraction and dispersion will often disguise certain degrees of color and may make a darker diamond appear whiter when viewed with the unaided eye (without magnification). The size of the diamond will also affect the appearance of its color. Color can easily be seen in larger diamonds as opposed to smaller diamonds. Often times it is difficult to see color in diamonds under a 1/2 carat with the unaided eye. Gemologists use magnification to determine the difference in color of two otherwise similar diamonds that may be two or three color grades apart. In larger size diamonds it does become easier; however while there may be a very fine disparity between one color grade to the next, the cost can be significant. If a larger diamond is a priority, you should consider sacrificing slightly on color. The shape of the diamond will affect its color as well particularly step cut diamonds such as the Asscher and Emerald that have large open facets and do not display the brilliance of other cuts. The center of these diamonds display a “window effect” where some of the color in the diamond can appear washed out and make it appear whiter then its actual color grade. The shallower the cut of the diamond the more apparent this will be. One additional factor in grading the color of a diamond is fluorescence. Fluorescence is the emission of visible light by a diamond when it is exposed to ultraviolet radiation. Approximately 10% of all diamonds on the market today exhibit fluorescence. Years ago, these diamonds were referred to as blue white diamonds. Today, fluorescence on a diamond certificate is divided into five different categories: none, faint, medium, strong, and very strong. Most diamonds that do fluoresce do so in a blue color; however, yellow and other colors are possible. Fluorescence can be both a negative and a positive. In the strong and very strong range a diamond may appear oily or cloudy which will greatly reduce the attractiveness and value of the diamond. However, diamonds of I color and lower can actually look whiter with some fluorescence which; enhances their value. Better quality diamonds with fluorescence generally sell at a discount to similar ones without. The usual reason is not that it is less beautiful, but that the general public is under the opinion that fluorescence is a negative. It is easier for a jeweler to sell a diamond without fluorescenc than it is to try and explain it. With so many diamond shapes available on the market today, how do you know which one is right for you? Each diamond shape offers something a little different. The round brilliant cut and the princess cut offer the most sparkle and fire while the emerald cut offers a classic elegant look. Here is a look at the top 10 diamond shapes for engagement rings sold today. More than 100 years ago, a Russian Mathematician named Marcel Tolkowsky, who was a member of a large powerful diamond family, calculated the number of cuts necessary to create the “ideal” diamond shape, known today as the brilliant cut. Since that time, cutters have been using advanced techniques and mathematical calculations to intensify brilliance and fire. The Round Brilliant (aka brilliant cut) shape diamond is the most popular of diamonds shapes. It consists of 58 facets and displays the most brilliance, fire, and scintillation of all diamond cuts on the market today. The Asscher cut diamond was developed in 1902 by the Asscher Brothers of Holland and is a variation of an emerald cut. The Asscher cut is a stepped square cut also known as a Modified Square Emerald cut. This cut offers a small table (largest facet on a stone) high crown (top portion of the stone) deep pavilions (lower portion of the stone), and cut corners. With its 72 wide step facets it resembles that of an octagon and sparkles like the Round Brilliant. The recommended length to width ratio for this diamond shape is 1.0 – 1.05 which will provide for a square look. The “Emerald Cut” was originally developed for cutting Emeralds not diamonds and this is how it received its name. The Emerald cut provides for a very elegant classic look and is known for its long lines. The pavilion (bottom portion of the stone) is cut with large facets to create an optical appearance and because of this clarity, cut, and color are very important factors when considering this cut. The recommended length to width ratio for this diamond shape is 1.30 – 1.40. The Cushion cut diamond is unique with its rounded corners and larger facets and is also known as a pillow cut or candlelight diamond. The Cushion cut is an antique cut that is a cross between the Old Mine Cut popular in the late 19th Century, early 20th Century and an Oval cut diamond. This cut provides for a classic look and is not as brilliant as the more modern cut diamonds. The Cushion has large open facets so clarity and color are important factors when considering this cut. The recommended length to width ratio for this diamond shape is 1.25 – 1.30. A ratio between 1.0 – 1.05 offers a square look whereas a ratio greater would offer a more rectangular look. The Heart shaped diamond is known as the most romantic of all diamond cuts. The Heart is essentially a Pear shaped diamond with a cleft. This cut is very distinctive and is beautiful when set. Symmetry and length to width ratio are very important factors to consider when purchasing this shape. The recommended length to width ratio for the perfect heart shape is between .90 – 1.10. The Marquise cut resembles the shape of a football or classic style boat when viewed from above. The cutting method used for a Marquise is a “step cut” also known as a “table cut.” The facets on a “step cut” are cut in steps. The crown (top portion of the stone above the girdle), pavilion (bottom portion of the stone below the girdle), and table (largest facet on a stone) are cut in rectangular facets. The Marquise is bright, clear, and has a great deal of sparkle because the facets span the length or width of the stone and decrease, as they get closer to the table. The Oval is a brilliant cut and is an adaptation of the Round Brilliant. With its 56 facets it usually looks larger than a round stone of the same carat weight. It is a great alternative for someone wanting the look of the Round Brilliant, but also looking for something a little different. The Oval is a classic choice and flatters the shape of the hand as the length of the Oval accentuates long slender fingers. The Pear is a brilliant cut diamond and is half Oval and half Marquise. The Pear resembles that of a tear drop pointed at one end and rounded on the other. An ideal Pear cut has 58 facets offering a display of brilliance and fire. The Pear is unique and is a great alternative to the round brilliant. The Princess has sharp uncut pointed corners and with 58 facets are known for their brilliance and fire. There is no other rectangular or square shaped stone that comes close to the Princess in terms of brilliance. The Radiant has the brilliance and fire of the traditional Round Brilliant, but the shape of the Emerald and Asscher cuts. The Radiant was designed with 70 facets for the maximum amount of brilliance. It has cropped corners and is often slightly more rectangular over square shaped. When grading fancy cut diamonds often times the overall look of the stone is more important than all the proportion details you would look for in a round brilliant. Color and symmetry are still very important, but your eye and personal taste will ultimately determine if the diamond is beautiful. For fancy cuts, there is no worldwide consensus about beauty. Fancy cuts; brilliant cut, step cut, and mixed cut. The most popular cutting style is the brilliant cut. For fancy cuts, graders measure the table width and stone width then calculate table percentage. Brilliant fancy cuts are measured from the belly (slight curving center of the long side of a Pear, Heart, Oval, and Marquise) bezel facets. Step cuts are measured in the middle of the stone because the facets are not always parallel and this measurement provides consistent results. The following formula is used to calculate table percentage: Table width divided by stone width x 100 = table percentage rounded to the nearest one percent. Large tables are common for fancy shape diamonds. Crown angles are estimated for fancy cuts diamonds. To obtain the estimate, graders look along the length of the stone’s profile. For brilliants, graders examine the bezel facets at the belly and for step cuts, graders examine the profile of the middle row of facets. Unlike round brilliant cut diamonds where a numerical value is applied to the crown angle, a fancy cut diamond’s crown angle is listed as acceptable, slightly shallow, very shallow, slightly steep, and very steep. Girdle thickness for fancy cut diamonds is evaluated in the same manner as it is for round brilliants however, allowances must be made. For example, when evaluating girdle thickness for a heart shape diamond the cleft and point will have a thicker girdle than the rest of the stone because of the shape. To evaluate pavilion depth, graders consider three main factors; face-up appearance, total depth percentage, and the relationship between crown height to pavilion depth. To determine a final assessment of the diamond, graders consider all of these things individually then together. First, graders look at the stone face up to determine the stone’s brilliance. The appearance will determine if the pavilion is steep or shallow. If the stone looks glassy or if the girdle’s reflection can be seen at the sides of the table the pavilion is most likely shallow and if the stone looks dark the pavilion is most likely steep. After evaluating face up appearance, graders consider the total depth percentage. This is the diamond’s depth from the table to the culet and is expressed as a percentage of the width. The normal range for total depth percentage is 55% to 65%. If the total depth percentage falls outside the range graders will begin to evaluate other proportions. If the stone is deep, graders will look for a high crown, thick girdle, or deep pavilion. If the stone is shallow, graders will look for a thin crown, thin girdle, or shallow pavilion. Note – even if the diamond has a total depth percentage within the normal range it is still important to examine each component of the diamond. To evaluate pavilion depth, graders look at the profile of the diamond and compare the crown height to the pavilion depth. A well-proportioned diamond’s pavilion should be approximately 2.5 to 4.5 times the depth of the crown. The final step in evaluating the pavilion is the bow–tie effect and pavilion bulge. The bow-tie effect is a dark area across the center of an elongated brilliant cut. When viewing the diamond face up the bow-tie will be visible in all stones however, this should be faint and not dark. Pavilion bulge is the outward curve of the pavilion facets on a step cut diamond. Cutters will sometimes cut the top row of pavilion facets wide and at a steep angle. This creates a bulge and increases weight, which in turn causes light leakage and can make the stone difficult to set. Culet size is graded in the same manner for fancy cuts as it is for round brilliants. In fancy cuts the culet is sometimes elongated so the grader will only consider the culet’s width as a factor in its size. Shape appeal is not the same as symmetry. Shape appeal is what shape is pleasing to your individual eye. Length to width ratio is a characteristic of fancy cuts and is an aspect of shape appeal. Length to width ratio is the relationship between the length and width of the diamond. Certain ratios are more “eye pleasing” than others. To calculate the ratio you will need the length and width of the stone. Once those numbers are determined, you divide length by the width and round to the nearest hundredth. That becomes the first number in the ratio with the width always being one. When shopping for an engagement ring you’ll hear words like cut, clarity, carat weight, color, the 4Cs, fire, brilliance, prong set, pave, and many others. Having a basic understanding of not only diamond terminology, but engagement ring terminology as well will benefit you greatly as you begin your search. Here are some diamond and engagement ring terms you should familiarize yourself with before you begin your engagement ring search. Brilliance – the brightness that stems from the center of the diamond. Brilliance occurs when light enters through the table, reaches the pavilion facets, and is reflected back through the table. Facet – a smooth flat plane on the surface of a diamond. Facets allow light to enter a diamond and reflect off its surface at different angles creating color and light. Scintillation – the flashes of light and dark areas you see when the diamond, light, or observer moves. A Prong setting (aka claw setting) is the most common type of setting for solitaire diamond rings. The diamond is placed in a metal head or basket and it is secured using 3-8 prongs. The shapes of prongs vary in style and may even contain small accent diamonds. Advantages – allows more diamond to show than any other style, is secure, easy to clean, and is quick to set. Disadvantages – does not provide a smooth surface and the prongs can catch on clothing or hair and the girdle area of the diamond is left exposed. A Channel setting is very popular for not only engagement rings, but wedding bands as well. The diamonds are placed in a row and are “suspended” between two continuous pieces of metal on the top and bottom with no metal between each stone. It provides a smooth surface across the ring and protects the girdle of the diamonds; which makes it a great setting choice for someone that is very active or uses their hands a great deal. The diamonds used for a wedding band are usually all the same size, but may differ in size for engagement rings graduating from larger to smaller down the shank. Advantages – protects the girdle area of the diamonds and provides for a smooth surface. Disadvantages – more time consuming and costly to set than a prong setting because all stones must be evenly spaced and secure. A Pave setting (aka bead setting) contains small round brilliant cut diamonds that are set level with the surface of the ring. Tiny holes are made in the setting and once the diamond is placed into the hole the surrounding metal is raised to form tiny beads or prongs that will hold the diamond in place. Pave adds brilliance to the ring and creates the illusion of a larger center stone. Pave settings are commonly designed using white gold or platinum to minimize the appearance of metal. Pave settings are quite durable, but aren’t for everyone. Pave settings also require a little more cleaning and care than prong, channel, and bezel settings. Advantages – provides great protection for the girdle and pavilion, accentuates the center stone and can make it appear larger than a prong setting, and it allows for an uninterrupted design. Disadvantages – it doesn’t provide for a smooth surface like a channel setting or channel setting. Platinum is rare, pure and known for its durability. Platinum is 95% pure and will not fade or tarnish keeping its rich white color for a lifetime. With everyday wear platinum will develop a patina overtime. Platinum is extremely strong and will hold precious stones firmly and securely in place. Platinum will scratch, but unlike other metals no metal is lost it is just displaced. Platinum is hypoallergenic and is a great choice for someone with sensitive skin. Palladium is part of the platinum family and has a grayish white tone. It is 10% stronger than platinum and consists of 95% palladium and 5% ruthenium which makes it more scratch resistant than platinum. Palladium is also a hypoallergenic metal. White Gold, available in 10kt, 14kt or 18kt, is pure gold alloyed with palladium, zinc or nickel. The alloys in white gold make it stronger than yellow gold. To mask the slightly yellowish tone in white gold it is rhodium plated giving it a bright white finish. Yellow Gold, available in 10kt, 14kt or 18kt, is pure gold alloyed with copper and silver. Its color looks great with all skin tones and gemstones. Rose Gold, available in 10kt, 14kt or 18kt, is pure gold alloyed with copper. Rose Gold has a soft tone that compliments the skin’s natural coloring. Rose Gold comes in a variety of shades from reddish to a soft pink. Rose Gold is not recommended for individuals with metal allergies because of its copper alloy. Today, there are many choices of metals for an engagement ring. Over the years, engagement ring settings have become just as important as the diamond itself. Gone are the days of the traditional yellow gold four prong solitaire style rings. These days, settings are more elaborate and stylish. Two-tone is a combination of two different color metals. The most common two-tone rings are either platinum or white gold with either yellow gold or rose gold. Carat is the standard term used for the weight of a diamond and received its name from the seed of a carob tree. The carob tree, which is native to the Mediterranean region, is an evergreen tree with an edible pod containing seeds. The carob seeds were used by early diamond traders as counter weights on balancing scales as units of weight for small amounts of diamonds because of their consistent size. The weight of the carob seed was 200 milligrams and the weight of a carat is exactly 200 milligrams or as it is know today, 0.2 grams. One of the first questions we’re usually asked is “how many carats is it?’ Many believe that the term carat represents the size of the diamond however; carat represents the weight of a diamond. One carat is divided into 100 points. So, for example, a quarter carat or 25 point diamond weights .25 carats (cts). Diamonds weighing over one carat are expressed as carats and decimals. They are measured to the hundred thousandths of a carat and rounded to a hundredth of a carat. For example, a 1.25 diamond would be described as one point twenty five carats. The cost of a diamond is not measured in weight alone. Several diamonds of the same weight can be priced considerable different. When calculating the cost of any diamond; clarity, cut, and color are major factors as well. It is also important to understand that a 2 carat diamond will not look twice the size of a 1 carat diamond. Since a diamond is three dimensional, the carat weight is dependent on both the diameter and depth. A 1 carat ideally cut diamond averages approximately 6.45 millimeters in diameter and a 2 carat ideally cut diamond measures approximately 8.15 millimeters in diameter. This is about 26% more in diameter than a 1 carat however; the price is about 4 ½ times greater. As diamonds get larger in size they are also more rare and the price increases accordingly. Weight of Round Brilliant Cut diamonds vs. their size. Diamonds are always measured in millimeters. Proportions for ideal cut diamonds shown below. How big of a diamond should I buy? Carat weight is a personal preference and is a decision we can assist you with, but ultimately, you will need to decide what is most important to you. For some, color and clarity are more important than size and customers will sacrifice size to obtain the best color and clarity within their budget. Others will sacrifice on the color or clarity to get a larger diamond. Regardless of your choice, as a member of the American Gem Society we will only sell you diamonds that meet our standards for color, cut, and clarity and display brilliantly. Prior to selecting a diamond, we recommend you set a budget. By doing this first it will allow you to explore various combinations of color, clarity, and size that will not only meet your needs, but will keep you within your budget. Remember, weight will not always increase the value of a diamond. When a diamond is improperly cut it may reduce its brilliance. A shallow cut diamond will have more surface area on the crown and will look bigger than one that is cut deep with more of its weight on the pavilion. When a diamond is properly cut, regardless of weight, you get the most brilliance, fire, and scintillation which equals value. Shop all Since 1910 loose diamonds and engagement rings to find the perfect one for you.